Anyone with the heart of a romantic knows that cold winter nights are perfect—for cuddling, that is! So if you’ve been dreaming of a getaway with your sweetie, now is the perfect time to visit Inn Victoria, one of New England’s most romantic inns. Situated in the historic downtown of Chester, Vermont, Inn Victoria oozes charm, with gorgeous antique furnishings, fresh flowers in the guest rooms, and breakfasts you’ll want to linger over. But charming is only one side of the Inn, luxury is the other. Book a room at Inn Victoria and you can snuggle by the fireplace, take a soak in your Jacuzzi or claw-footed tub. Some rooms even offer a private deck with hot tub. You’ll also be pampered with premium 1800-count sheets, plush robes, and flat-screen TV’s—all the makings of a romantic getaway. For an even more dreamy winter weekend, check out our Special-Moment Romance Package. With this package, you call us and we’ll put together the best romance package ever. 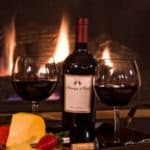 Everything from fine wines to sleigh rides, ski trips, and other activities and extras that will make it a memorable stay. Winter may be cold and snowy, but it’s warm and cozy at Inn Victoria! This entry was posted in Chester, Getaway, Romantic Getaway, Romantic Vermont B&B, skiing, sleigh ride, Winter and tagged Chester VT, Romantic Bed and Breakfast, Romantic Vermont Bed and Breakfast, winter by Penny & Dan. Bookmark the permalink.